The Japanese-style hot spring is called an onsen. Waters must be naturally heated and sufficiently mineral rich in order to be qualified as onsen. A dip into these waters is therapeutic and incredibly relaxing, especially after rafting, cycling or having other outdoor activities. You can even time your onsen visit to coincide with sunset over Yotei to complete your day with a magical moment! But before you go, acquaint yourself with the (not always obvious) onsen etiquette. There are over 15 different onsen scattered across the Niseko region alone. Why not get The Yumeguri Onsen Pass to try a couple of differnet onsens during your stay in Niseko? Not sure which onsens to visit? Vacation Niseko has come up with a list of highly recommended onsens in Niseko region. Read on to find out more. 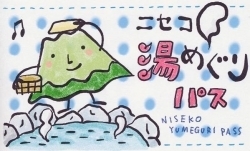 The Yumeguri Onsen Pass can be purchased for 2,160 yen per person. This provides 4 tickets that can be used at 20 different onsens in the Niseko Area. The pass is valid for 180 days so you can use the pass at 4 different onsens or you can visit a single onsen multiple times.